Chicharon is a Filipino’s favourite snack. Why? Well this local delicacy is crunchy, tasty, and just sinfully good. Chicharon is salted deep-fried pork rinds, but chicken skin and pig intestines are also common variations of the dish. Health buffs generally try to stay away from Chicharon because of its high sodium and calorie content but since it is so tasty, most Filipinos have it as a snack or pulutan (finger food) especially when drinking liquor amongst friends. Besides beer, Chicharon is eaten with different kinds of dipping sauces and condiments such as vinegar, soy sauce, bagoong (shrimp paste), and sarsa (liver sauce). Sometimes Chicharon is used as a garnish or ingredient in other Filipino dishes such as Pinakbet (a vegetable stew) and Palabok (a noodle dish). 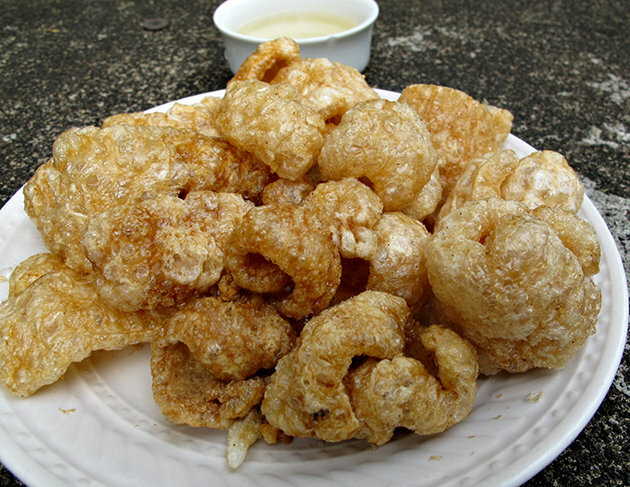 Most agree that Chicharoncame from the Spaniards, during their colonial rule in the Philippines, as many Spanish and Portuguese-influenced countries share similarities with the dish. For example, Chile’s chicharrónes is actually made up meat fat and is typically eaten with bread, whilst in Puerto Rico they are made from chicken, mashed and stuffed into a banana plantain. Philippine Chicharon can be bought anywhere in the country from street vendors to supermarkets. Typically, it is jut salted but many variations have been made to suit different tastes. They now come in chili, garlic, and inasal flavours. Some even sell chocolate-dipped Chicharon! Sinfully good indeed.